Spring fever is here, but not all signs in the zodiac are dealt the same dose of lovin’. Some signs are going to have a better love lives than the rest of us in May because that’s just the way the cookie crumbles. According to astrologer Linda Furiate, on May 15 the planet Uranus will move into the sign of Taurus, and this is significant for the love lives of only a few signs. Because Uranus is a slow-moving planet (it takes Uranus 84 years to complete one cycle around the Sun) it’s the first time it’s been in the sign of Taurus since 1934-1942. “Uranus is the planet that is called the ‘great liberator’. He will catch us off guard and surprise us with his desires,” Furiate adds, explaining that a few signs are going to have a very surprising romantic experience around the middle of the month. 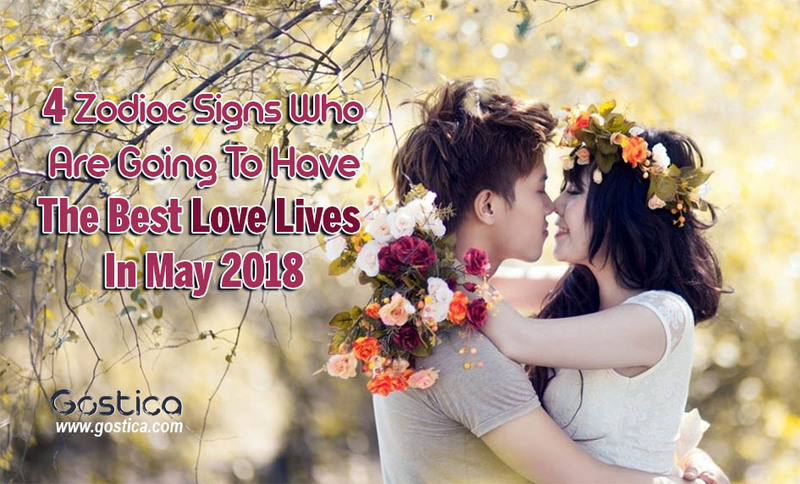 But if your love life isn’t popping in May — regardless of your sign — it’s not because it’s doomed. Rather, it could be because there’s something that needs fixing before it can reach its full potential. If you have a partner, talk to them about what isn’t working for you and see if there’s a way for both of you to find happiness in what you’ve already built. If you’re at the end of the road with your partner, try to find the will to look forward to the opportunities a new path will open up for you. If you’re dating and feeling exhausted, feel free to take a break. May might not be the month for romantic love, but maybe it’s the month for self-love. Maybe it’s the month that you get back on better terms with your own relationship with yourself. Be selfish, do the things you enjoy and see where that takes you in June. Here are the signs that will be enjoying a smoochin’ scorching May, according to Furiate. Taurus should look at May as the month of “yes”, says Furiate. “Taurus may find themselves most lucky in love this month,” she says. “Taurus may meet a new partner who totally moves them out of their comfort zone. Leo might have an intense month in the romance department, but ultimately a good one in the long run. “Leos may experience a sudden turn of events this month,” says Furiate. Recommended: 4 Zodiac Signs That Make The Best Husbands. May will kick off a pretty good run for the Scorpio, one that could last years. Um, do you hear wedding bells? “Scorpio may experience a good love life this month as well. In fact, the next seven years may be beneficial for Scorpio in love,” Furiate says. “Uranus will light up Scorpios 7th house of partnership and commitment. An unexpected relationship that begins this month may quickly gel into a long-term romance. Jupiter which is the planet that is associated with growth and opportunity is currently in the sign of Scorpio through November 2018. Aquarius might be about to have their “OMG I love Josh!” moment. “Aquarius may suddenly realize that they may have romantic feelings for a friend they have known for a while,” says Furiate. Don’t be bummed if you don’t see your sign in the list of lucky lovers. Just focus this May on unearthing the issues that are holding you back from feeling fulfilled. June will be here before you know it. My DOB 22/12/1970 time 5 to 6 am . I am want to know next 15 yrs job related carrier and financial purspective. Work hard and smart and earn money. Don’t waste your time here. I have wasted a lot here. Please believe in yourself and advance in your life.